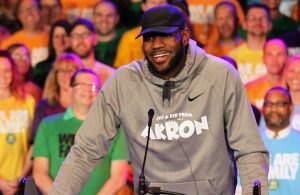 (Cleveland, OH) – After a four-year hiatus from the NBA Playoffs, the second-seeded Cleveland Cavaliers and their fans were given the thrill of postseason victory at Quicken Loans Arena with the Cavs’ 113-100 win in Game 1 over the seventh-seeded Boston Celtics on Sunday afternoon. First-game playoff jitters were clearly not an issue for Cavs stars Kyrie Irving and Kevin Love on Sunday, who complimented fellow superstar LeBron James‘ 20-point, seven-assist and six-rebound performance, with significant contributions of their own. Irving, who scored 20 points in the first half of the game alone, finished with a game-high 30 points (11 of 21 from the field, including five of nine from three-point range) in his playoff debut. 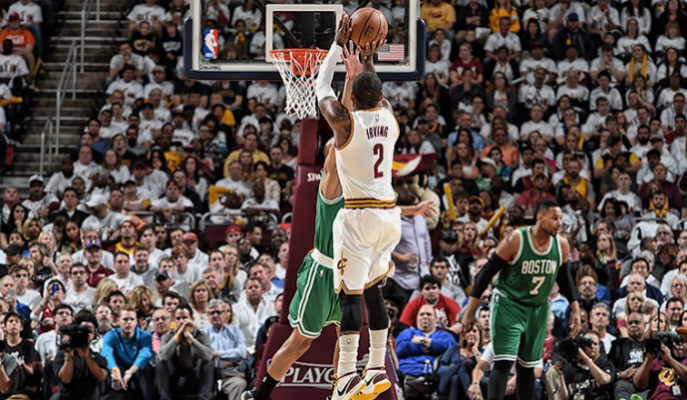 Irving made a good deal of high-difficulty shots that brought the crowd at the Q to their feet, especially his buzzer beater over Celtics shooting guard Evan Turner (12 points, seven rebounds and five assists in the game) at the end of the second quarter, which gave the Cavs a 62-54 lead at the half. Love, on the other hand, struggled in the first half of the game as he only made two of his first 11 shots. However, he bounced back with a strong second half to finish his playoff debut with 19 points, 12 rebounds and four assists. In order for the Cavs to protect their home court in Game 2 and improve to a 2-0 series lead heading to Boston, they must first continue to share the wealth between James, Irving and Love. The upset-minded Celtics, under first-year head coach Brad Stevens, had six guys that scored in double figures, including three players off the bench with at least 10 points. The Cavs’ reserves, who at various times this season have performed poorly in terms of maintaining leads, need to get even stronger production out of guys like Tristan Thompson and Iman Shumpert. The Cavs had a lot of trouble containing potential NBA Sixth Man of the Year candidate Isaiah Thomas, who had a double-double on Sunday with 22 points (six of 14 from the field and a perfect eight of eight from the foul line), 10 assists and five rebounds. Game 2 is scheduled for Tuesday night at Quicken Loans Arena and will be broadcast nationally on TNT, with the showdown slated to tip off shortly after 7:00 pm ET.